A pair of ornithologists – who loved owls – became caretakers of a small island sanctuary. Their favourite sanctuary birds were ruru, and between duties they spent every minute on owl research. They loved children too, so they adopted four, naming them Lawry, Rufous, Nina, and Tyto. The family lived on the island in the caretaker’s cottage. The ornithologists talked endlessly about owls to anyone who’d listen. Visitors to the sanctuary called them Doctor Owl and Professor Owl, and their children got nicknamed the Owl Kids. 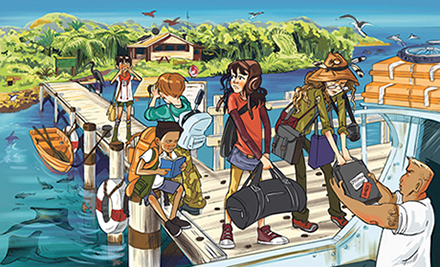 The kids did correspondence school and helped look after the rare creatures that survived in safety on the island. They felt safe too – until one terrible morning. Their dreams before sunrise were odd: Rufous dreamt he was making soup by throwing vegetables across the kitchen into a pot of water. Lawry was sorting out a noisy birds’ argument. Tyto had caught someone chainsawing down an ancient tree. Meanwhile, Nina dreamt Professor Owl was yelling at her. When she woke, it was true. The kids leapt from their beds. ‘How do you know?’ asked Tyto. The Professor said she’d woken to find him gone. She’d looked for him inside and out – in vain. ‘We’ll all help,’ said Lawry. She took Nina to search the coast, while Rufous and Tyto combed the bush. Three hours later, they hadn’t found him. Police arrived next, with boats and helicopters. For 10 days, strangers scoured the island and its surrounding sea, but Doctor Owl had simply vanished. The police said there was no more they could do. They called off the search. From then on, Professor Owl spent her days wandering the house, gazing out windows through binoculars. It was as if she’d forgotten she had children and an island to look after. Rufous cooked now, and Lawry organised everyone’s work. When the kids got into bed each night, Rufous told a joke or two, but no one laughed much, and they all fell asleep with difficulty, worrying that Doctor Owl might still be out there somewhere, alive. One night Nina said, ‘I miss hot chocolate.’ They’d had none since Doctor Owl disappeared. Rufous jumped up. 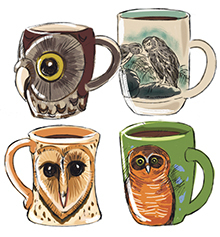 ‘Great idea!’ He brewed it and poured it into the special cups given to each of them on their first birthdays by Doctor and Professor Owl. As her brothers and sister closed their eyes, Lawry wished someone could tell her story. Her cup had an illustration on it from a book by a famous ornithologist who’d lived over 100 years ago – Walter Lawry Buller. It showed the extinct New Zealand laughing owl. She remembered how Doctor and Professor Owl used to argue about whether it might still exist in some secluded part of the New Zealand bush. Doctor Owl thought the idea ridiculous, but the Professor wasn’t so sure. To Lawry’s horror, the Professor began pacing the floor, babbling about owls and mysteries, and journeys. The other kids came into the kitchen rubbing their eyes, woken by the commotion. ‘Leaving the island?’ asked Rufous. ‘But laughing owls are extinct,’ said Tyto. ‘I’ll find evidence, don’t you worry,’ said Professor Owl. The kids spent the next week miserably sorting through belongings. They chose a few to keep, and watched the rest disappear on a boat to the mainland. ‘I don’t get it,’ said Tyto. The morning of their departure arrived. Lawry, Rufous, and Tyto took a last tramp though the bush, while Nina sketched the beach so she’d never forget the view. A water taxi roared up to the jetty, and the family piled on. ‘Do you remember where you left it?’ asked Lawry. Several minutes later, Nina clutched her cup with relief as they sped across the water to new adventures. Where did Rufus see the mug? Can you find it in the scene above? (Click on the picture to enlarge it). Want to read what happens next? We are adding other episodes of The Exploits of the Owl Kids to our website!